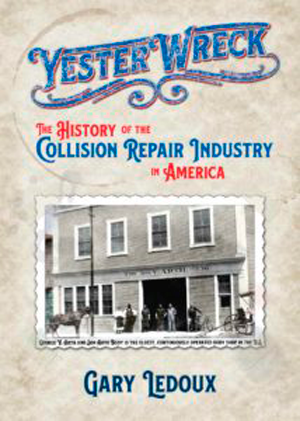 During the most recent Collision Industry Conference held in Las Vegas, Nev. on October 30, Gary Ledoux, author of the new book, YesterWreck: The History of the Collision Repair Industry In America, stopped to call Brandon Eckenrode, Director of Development for the Collision Repair Education Foundation to the stage to present him with a check for $500 for the Chuck Sulkala NABC Appreciation Scholarship Fund. A portion of each book sold by Ledoux is earmarked for the fund. The books first went on sale on September 12. The book is available to purchase directly through his website. Gary, thank you for your continued contributions to our great industry!